Ahhhh, Friday, oh how I love Friday! Let me count the ways!!! Sigh…. Hi Everyone, so very happy that it’s Friday! I am ready for the weekend, how about you? I can’t get over that we are into November already, that is just plain crazy to me! Honestly, I am not ready to let go of summer!! I love the summer, but one thing I love about the Fall is Cranberries!!! I never used to like cranberries until about two years ago! I made a recipe for cranberry sauce for Thanksgiving and ever since then I have loved it!!! Growing up I always thought cranberries just came in the can. You know the one that plops on your plate? 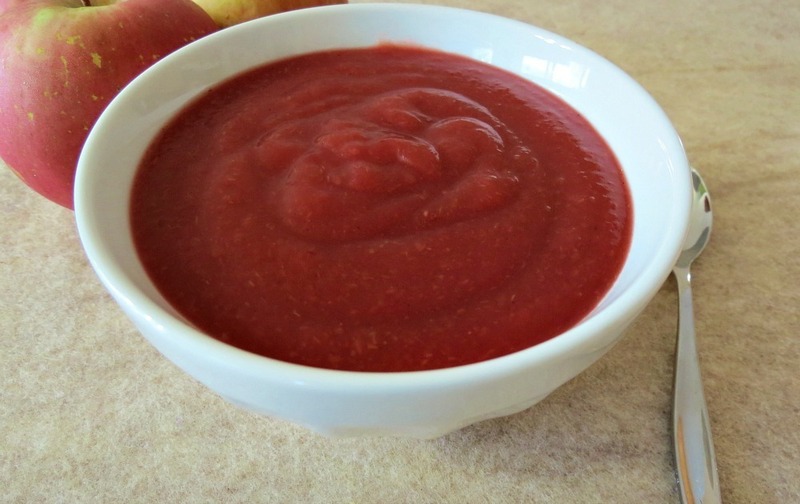 That cranberry sauce is nothing compared to homemade sauce, however my Husband begs to differ. He thinks the only kind of cranberry sauce is the stuff in the can. Yuk! So I make a batch of homemade for me for Turkey Day and I buy a can for him! I told him it’s like juicy catfood! I think I kind of grossed him out with that!!! Why buy can, when you can have homemade? I don’t get it? I guess it’s the gel thing. 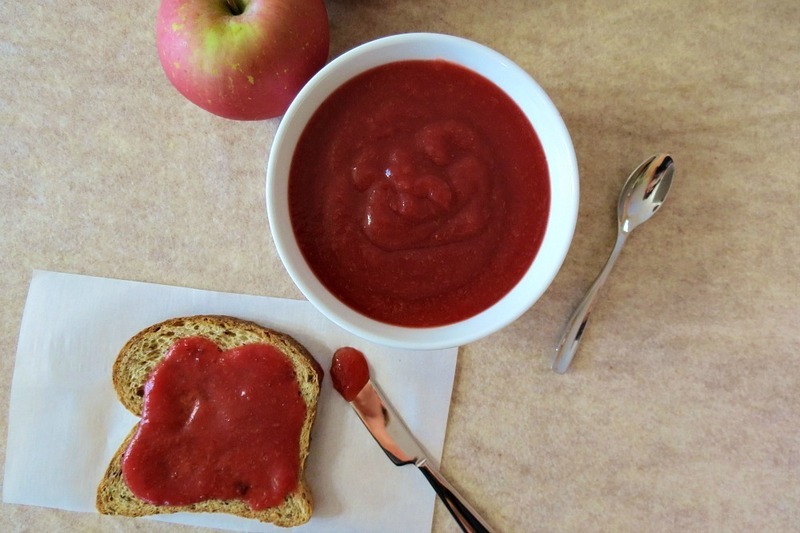 Well today I don’t have cranberry sauce for you, but I have something that you can sub for cranberry sauce and it’s easy to make and tastes mighty good if you ask me!!! 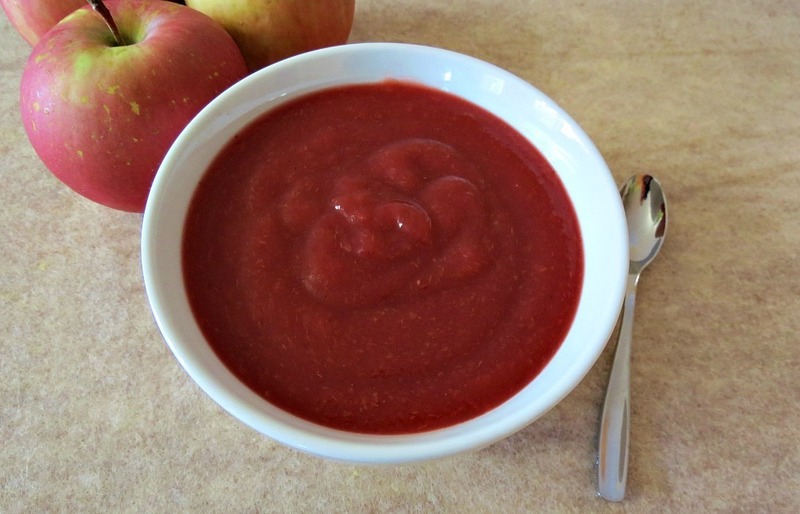 Oh, I didn’t tell you the name, Cranberry Apple Butter! Yum! Don’t you just love the name? 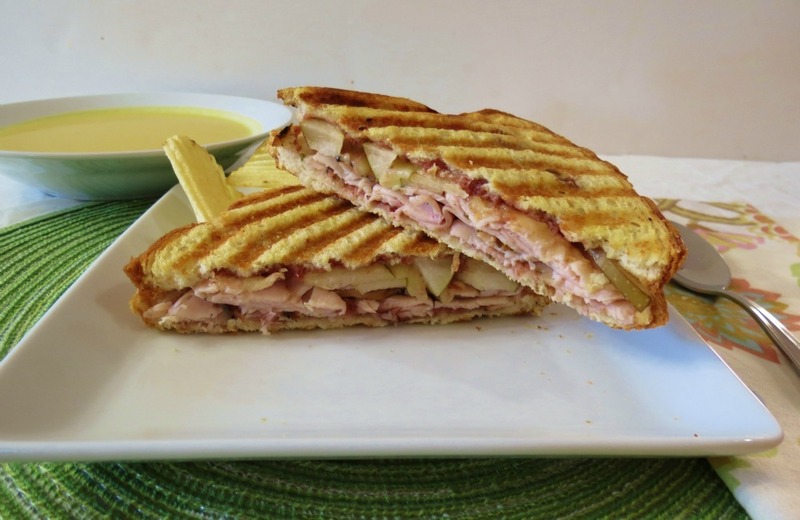 Remember about a month ago when I made the cranberry, turkey and pear panini sandwich and I found a jar of Trader Joe’s Cranberry Apple Butter in my cupboard? Well that was my inspiration for my recipe. See, one of my readers said they don’t have the Cranberry Apple Butter at their Trader Joe’s yet, so they will have to wait. Why wait? Now you can make it yourself, and you know what? Between you and I, it’ tastes way better than TJ’s, but don’t tell them I said so!! This is how easy the recipe is! I cored and sliced my apples, nope I didn’t peel them, add fresh cranberries, zest from the orange and then cut that up and threw it in the pot and topped it with 2 cups apple juice. Bring to a boil, cover and simmer for 20 minutes until the apples are falling apart. Then after they cooked down, I got my hand immersion blender and blended away. Don’t worry about the apple skins, they melted right in. You don’t even notice them, however you can peel them if you want, but why waste your time? 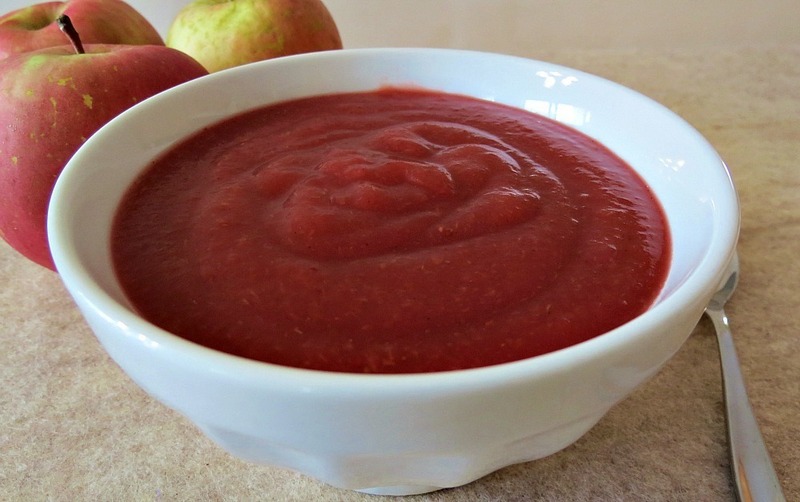 If you don’t have the hand blender, I would process the Cranberry Apple Butter in the food processor or blender. But honestly, if you like creamy soups, applesauce, butters and anything that can be creamed, why not invest in a hand immersion blender. I bought mine for $25.00 at Sur La Table, but I know they go on sale for under $20.00 at Target. Maybe on Black Friday? Maybe ask for one for Christmas? After I processed the Cranberry Apple Butter, I added 1/2 cup of brown sugar, 1 teaspoon of cinnamon and some nutmeg. Cooked it for 10 minutes until it thickened up. Let it cool and then I spooned it into my mason jars. Do not can this butter because there is not enough sugar in the recipe. You can store the butter in the fridge for about 3 weeks to a month. I wonder if I could freeze it? Can anyone tell me if I could freeze this? If I can, I’m going to because this recipe made almost 6 cups, and as much as I love it, I don’t think I could eat 6 cups myself, at least within a month, well maybe I’m wrong about that?. No one else in my family will eat it!! 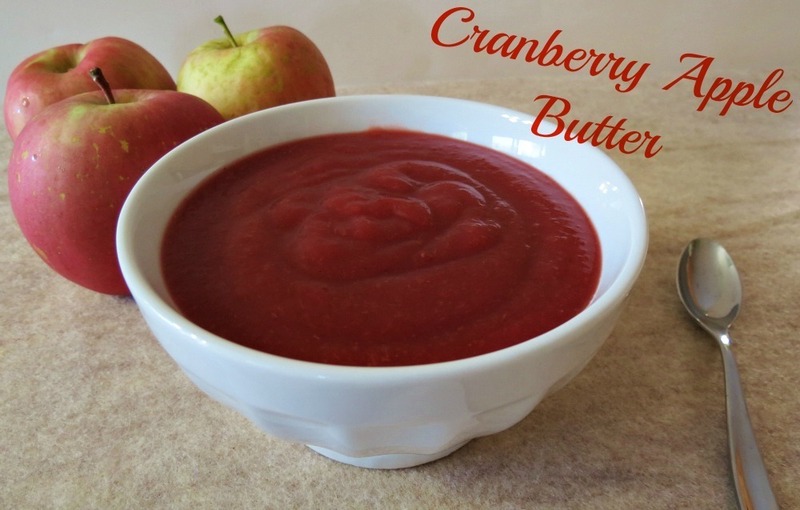 A creamy, thick, semi-sweet apple butter made with fresh cranberries and spices. In a large sauce pan add apples, cranberries and orange zest. Squeeze the juice of the orange into pot, and then add the orange. Add in 2 cups apple juice, place over medium heat. 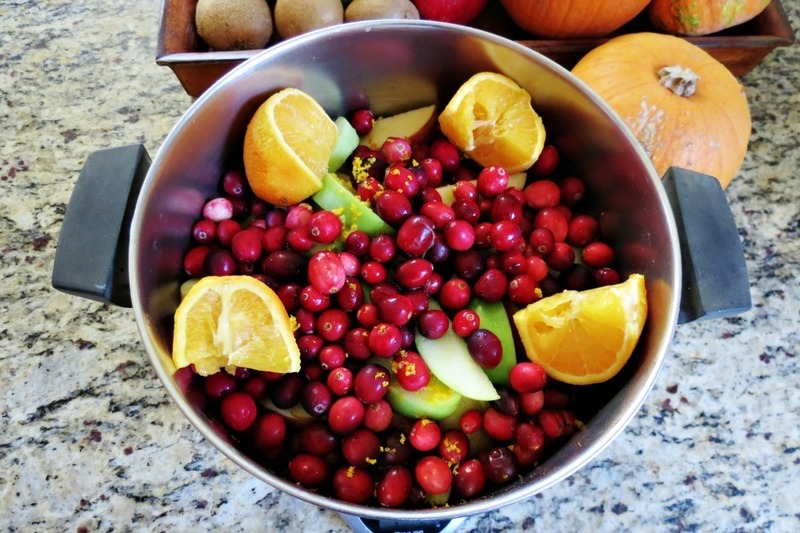 Bring to a boil, cover and simmer until apples are softened and cranberries pop. Approx 20 minutes. Stirring occasionally. Take the oranges out, and toss away. With a food immersion hand blender, process until creamy smooth. 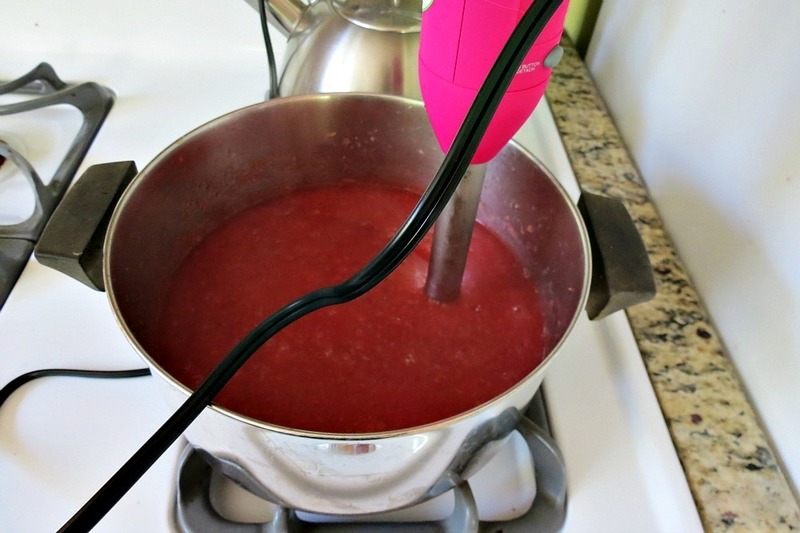 If you don't have a immersion blender, process in batches in your food processor or blender. Over low heat add cinnamon, nutmeg and brown sugar. Cook for approx 10 minutes until thick, stirring occasionally. 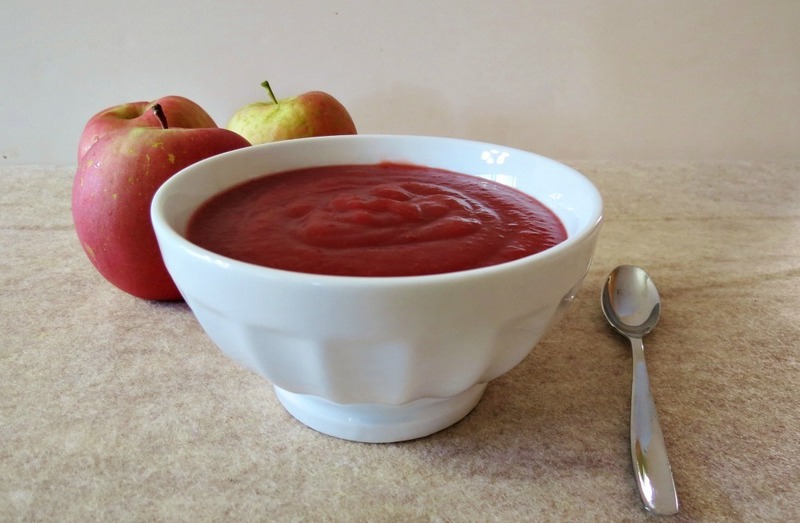 So what do you do with Cranberry Apple Butter? Well, glad you asked! You can dip crackers in it, make oat bars, put in bread or muffins, smear it on a cranberry walnut roll, hint, hint, use it as a side dish like applesauce, top pancakes, top it on chicken or turkey or make my Turkey,Cranberry Pear Panini Sandwich. I guess you can tell I love cranberries!! If you want to more cranberry recipes, here are some of my past ones, but beware some of the pictures are not great since I made them before I learned anything about photography! Wow! I guess I didn’t realize how many cranberry recipes I have!! I think I need to make them again with better photos! I’m thinking scones and biscotti! Yum! P.S. Don’t forget to enter my coffee maker giveaway! I am wanting a turkey sandwich myself!!! Sounds like a great idea for dinner! Today I saw some fresh cranberries on our grocery, but I didn’t buy them as they are so unusually expensive. I can only imagine how delicious this would be on some homemade bread for the breakfast! I bought my cranberries from Trader Joe’s and they were $1.99 a bag. The [rice will come down! Ohhhh in homemade bread, yummy! I luuurrrvvee that TJ’s apple cranberry butter! Could seriously smear it all over anything…or just eat it straight from the jar. Your homemade version sounds oodles better! So glad I came across this on Pinterest! 😉 I’m w you, fresh cranberries are the only way to go! Glad you found me! I love regular and dried cranberries, but the stuff in the can, blah!! Found this post on Pinterest and repinned!! Did you remove the quartered oranges before blending (because of the peel)? Planning on making this soon! Lol, I just bought a jar of this from TJ’s. Your homemade version is so much better!